The first settler to lay claim to the land on which Hunting Ridge sits is John Scutt, who in 1695 received a patent for 400 hundred acres that stretched from present day Edmondson Avenue to Franklintown Road. At the time "Hunting Ridge" referred to the land running along the entire high ridge from about the present Edmondson Village Shopping Center westward through Catonsville. Mr. Scutt eventually lost the land (cause unknown) and at some point the land was owned by an English colonist named John Bailey. John Bailey's son, by the same name, sold the land to Daniel Dulany in 1769. Eventually the Dulany family built a mansion that stood on the current Edmondson Village shopping center grounds, and this was named Hunting Ridge. In 1780, Daniel Dulany, who tried to remain neutral through the Revolutionary war, had sold (or was forced to sell) his land into four parcels after seeing some of his loyalist friends lose their property to those faithful to colonial interests, emboldened by their recent victory. The next owners of record are shown in this map from 1877. Basically, the railroad industrialist Thomas Winans (see bio on Thomas Winans) had owned a good portion of Hunting Ridge and the land northwest of it, including the famous Crimea Mansion property, across the current Leakin Park. John Cook, proprietor of the Breisgau Fruit Farm, had a large parcel of modern-day Hunting Ridge along Cooks Lane, and the family of General John Swan owned much of the eastern portion. Between 1898 and 1915, many changes were taking place all around current Hunting Ridge, but the Winans property itself was undeveloped and belonged to Mrs. George M. Hutton, the married name of Winans' daughter Celeste. John Cook's property and fruit farm saw more buildings go up - to be known as Cooks Row. By 1915, the streets of Ten Hills were constructed as that neighborhood began to develop; and to the east, the border of Baltimore City was now out to the eastern side of Rognel Heights. Three years later the border will move west again to where it is today, encompassing all of Ten Hills and the land in Hunting Ridge. n 1922 the George R. Morris Organization, a Baltimore real estate firm, began to develop a large tract of land purchased from Mr. G. M. Hutton, who then owned what had been known as the Thomas Winans Estate. 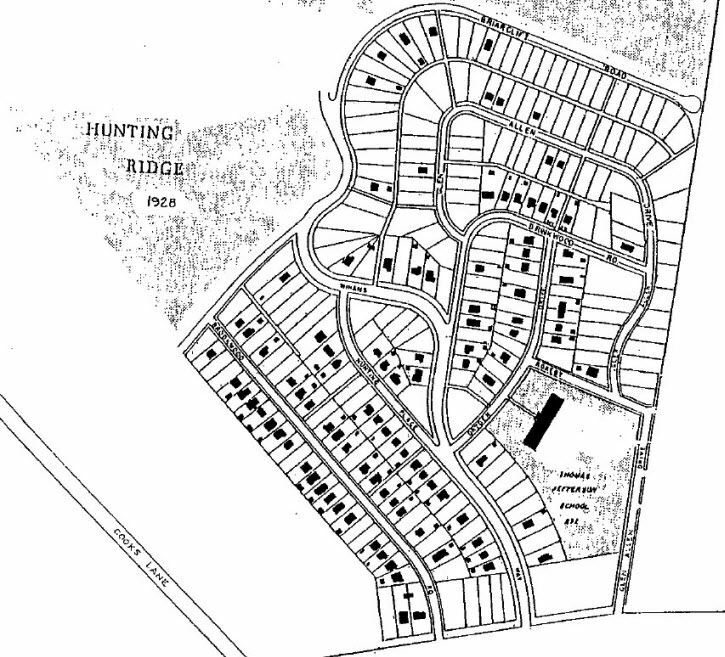 The George R. Morris Organization had prepared a plat of the Hunting Ridge community plan which included 269 building lots, showing most of the streets as we know them. Lots for the first 10 houses, or cottages as they were first advertised, were sold within a year. It is unknown when the first family moved in, but the Fall edition of the 1923 phone book listed two homes with addresses in Hunting Ridge. By 1928, construction was well underway with nearly 100 homes built in Hunting Ridge. The original Thomas Jefferson School #232 constructed in 1923 served the new Hunting Ridge residents along with the communities it was already serving, Rognel Heights and Ten Hills. The Swan Avenue firehouse had been long standing at the ready since it was built in 1921. Hunting Ridge Presbyterian Church began construction in 1929. The Depression took its toll on the pace of building homes. To help with cash flow problems, the George F. Morris Organization (operating as the North West Real Estate Company) sold many plots to other builders, most of who were related in some way (senior executives) to the George F. Morris Organization. 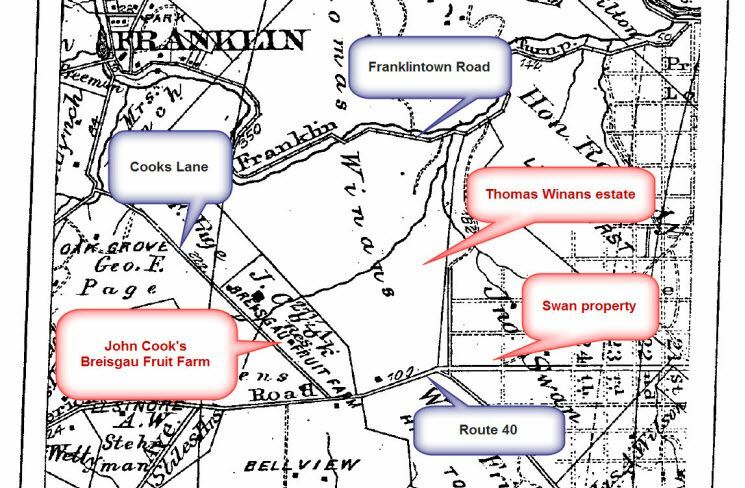 It should be noted that early maps of Hunting Ridge did not show Winans Way extending to Franklintown Road. This would not occur until 1928 when the City of Baltimore bought land from Mrs. Hutton for the roadway. The homes on Colherne and Nottingham Roads (where Cooks Lane meets Edmondson) were originally a subdivision unto themselves called Nottingham, named by their developer after the road on the south side of Edmondson Avenue. This little community was built on land purchased from John Cook's estate in 1928 and a year later many of the semi-detached homes were nearly completed. At some time in 1970s the residents of Nottingham chose to join the Hunting Ridge Community. As evident in the 1928 map, the land of the future Nottingham apartments and upper Briarclift Road (to Cooks Lane) were not part of the original Hunting Ridge plans. These homes and additions sat on the Cook property which was kept in the family until 1953 when they sold it to the George Awalt company (Mr. Awalt was a former Geo. Morris executive). Until that time, Briarclift simply ended at the foot of Brookwood where an active stream poured water into a drainpipe that diverted the water down to the intersection of Briarclift and Winans Way. In 1954 the two surviving Cook family members sold 12 acres to a company named Westpark, Inc. This development company was run by George Miller and William Meyer. They designed a small community incorporating a combination of row homes, semi-detached homes, and individual homes, using existing street names were appropriate, and adding two new streets to the landscape. Westparkway was named for the development firm, and Milyer Lane was named for Miller and Meyer. Sales were handled by Lindsay Realty. The Westpark homes were nearly all built in 1955 and 1956. Some years later the residents decided to be represented by the Hunting Ridge Community Assembly.